Beware! 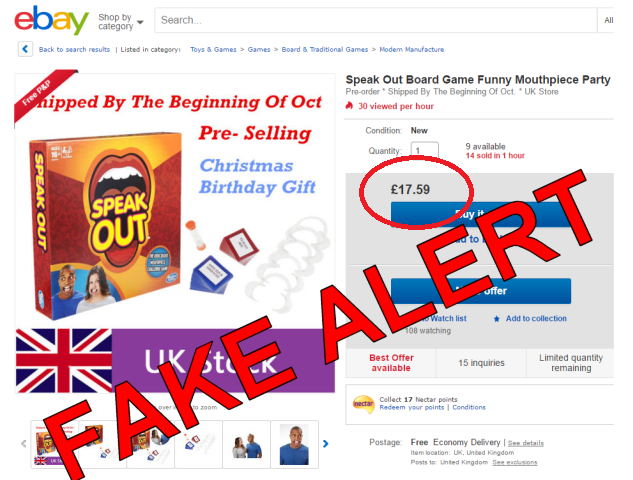 Fake versions of the currently hugely popular Speak Out game are in UK circulation. Produced in China, these convincing copies are currently selling very well in the UK due to the current popularity of the game and scarcity of stock of the official game. How do you spot a Speak Out game fake? They are generally sold online on eBay, Gumtree or Amazon Marketplace (Third party sellers NOT Amazon themselves). The selling price is normally £19.99 or below. The official selling price is £19.99, however due to Speak Out currently being Out of Stock at all major UK online retailers, sales of genuine official games on eBay fetch a much higher price. Therefore, be suspicious of a seller that seems happy to be selling at a cheaper price than many other sellers. Ask yourself, why would someone sell a product for £15 when they are flying off the shelf at a higher price? Sellers are not selling these for the love out it, they are doing this to make as much profit as they can. The eBay seller is from China or other products they sell show as "dispatched from China". Don't just check the Speak Out game eBay listing, which will often show "Item location: UK, United Kingdom", check the sellers other listed products, if they come from China the likelihood is that it's a fake. Don't take any notice of images of the Union Jack flag and "UK Stock" text within it. Last year fake Pie Face games were also in circulation in the run up to Christmas 2015. Like now, stock was in short supply and Chinese counterfeiters were easily able to copy the game quickly and get to the UK market to make a nice profit. The discount store B&M even got caught out selling fake Pie Face games and were ordered by the manufacturer Hasbro to immediately remove the stock from it's shelves. Ultimately you need to make a judgement call yourself as to whether you are happy to purchase a fake Speak Out game cheaply and easily. This is not something that we would recommend especially as the game involves placing a piece of plastic in your mouth! Would you be happy letting your kids play with a fake version! ?